Are you the types, who like a twist in the tail? Well in today’s context, this is one of those twists that will perhaps make one take notice. Yes, we are talking of Hyundai Eon which has been recently fitted with a new power plant in the form of a 1.0 litre ‘Kappa’ petrol engine alongside the existing 0.8 litre unit. Will it be able to excite the instinct for an actual buyer is something that we are precisely going to find out. 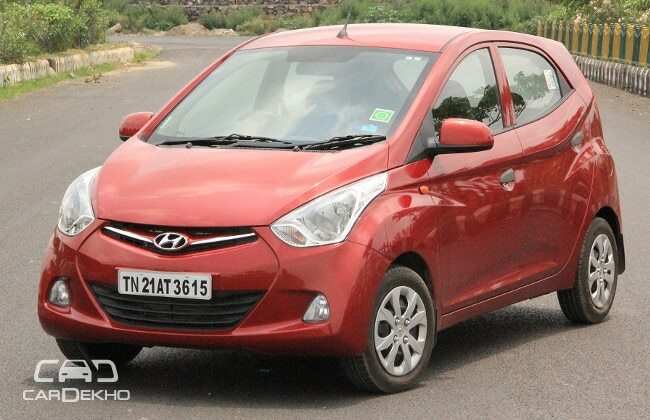 Classified as an entry level small car by Hyundai, the Eon was meant to take on the popular Maruti 800, Alto, Datsun Go and most importantly the country’s cheapest car; the Tata Nano. Leaving aside the competition, Hyundai Eon is an extension of the company’s most talked about Fluidic Design philosophy that inherently gives it a very striking appeal in both shape and form. Might we remind you, that this is a facelift, but nevertheless what one gets is a very attractive looking small car in the shape of the Eon. Its overall design portrays flowing curves and strong character lines. This is further highlighted by the front end which bears a sculpted bonnet, its grille has chrome lining with the Hyundai logo sitting right in the centre, pulled back headlamps and a pair of fog lamps further adorn the front fascia. Body coloured door handles and side view mirrors blend in perfectly with its curvaceous side profile, not to forget the plastic wheel hub caps which look quite elegant. While the rear with its distinctive tailgate, courtesy caved lid, has an attraction attached to it. Crystal clear lamps with a Eon 1.0 badge adorn the boot lid along with Magna Plus that indicates variant type. At first glance, the dual tone interior does give a sense of satisfaction. The quality of plastics is pretty good and superior in some cases while referring to competition. Its dash comprising of black and silver plastic is tasteful as it provides a centre console comprising of AC controls, a 2 din music system with facilities such as a USB port and Aux-in. The availability of a tilt steering wheel is an added benefit apart from the fact that its hold is pretty good. Right below it is the instrument cluster that comprises of an odometer, fuel and temperature gauge that blend in quite nicely with its black background. 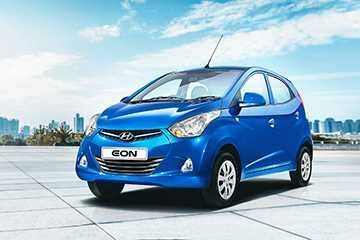 Specific to rains, the Eon does lack an intermediate mode while referring to wiper controls. With excellent under thigh support, both front and rear seats are pretty comfortable not to mention the perfect combination of fabric and leather that compliment the experience as a whole. Space in regards to shoulder and leg room is fairly decent while the boot size of the Eon stands at 215 litres. ‘Lighting speed and performance’, well almost in its literal sense; the new 1.0 litre is something to be experienced. Get behind the wheel and automatically one can feel the power that is available at the tap of your foot in comparison to its smaller sibling (800cc engine). In detail, this 998cc 3 cylinder DOHC petrol engine churns out a power output of 68 bhp with 94 Nm of torque. It is visible by the manner in which it moves which is attributed to its five speed manual that throws out smooth gear shifts. In a straight line, the 1.0 litre Eon sprints quite nicely but the moment one crosses the 80 kmph barrier, the small car tends to be edgy due to its light body construction and a bigger engine. Therefore handling is something that needs to be paid attention to while ride quality can be easily said is at par with rest of competition as going over potholes and broken roads isn’t really an issue for the Eon. Eon 1.0 litre is a power house on four wheels, small enough to be played like a toy but mind you with it comes the issue of handling. Rest is all great in terms of design, interior comfort and performance which will surely take you by surprise. A tinge of twist with all flavours of valuable experience, this Eon is perhaps an attractive machine to look at while considering an entry level small car.